Easy to use software often means the program has no depth. Tim Macer discovers one web interviewing package rich in complexity. The difference in meaning between the words simplicity and simplistic, a trap that awaits those speaking English as a foreign tongue, can be illustrated perfectly in the shortcomings of some web interviewing solutions. Simplicity is the feeling that first attracts you to use it: simplistic is the conclusion you may reach, after an unpredictable period of time, when you realise you are cleverer than it is. If, as some do, you have worked through several packages on this principle, it may be time to take a look at CfMCs WebSurvent: a program for which the word simple, in all its forms, has little relevance. 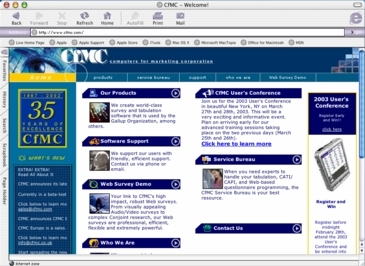 Remarkably, this is a program with a 35-year pedigree: CfMC is the worlds longest established specialist market research software provider. While the majority of CfMCs customers are in America, the company surprised observers last year by opened its first European sales and support office in London at a time when other companies were scaling back their international outposts. This legacy is evident in how the software pays attention to the details that more recent arrivals overlook. WebSurvent shares its scripting language and system architecture with Survent, a CATI package that is very widely used throughout the United States. In a few months, CfMC will be launching a hybrid web-CATI solution. Until then, the two exist very much in parallel. This web program is probably unique in the web survey world for having no graphical user interface design tool. It takes several months to learn the Survent language properly. Users report they are still diving into the manual or calling on CfMCs highly respected support helpdesk even after years of regular usage. You also need to have a good grasp of HTML coding, as you need to enter various code snippets into the spec you write. But the spec language is highly productive in the hands of experienced users. There is an emphasis on saving effort and duplication when writing scripts, such as its ingenious repeat function for rattling through scale batteries, and the way that HTML code and defaults can be set up or over-ridden with ease throughout the spec. frequently adding more, in response to customer requests, often at no additional cost. Put several numeric fields on one screen for a grid of questions that must add up to 100%, and the program will complain as soon as the sum exceeds 100. Error reporting is a particularly strong feature of the software. Many web packages either hard-wire messages or ignore this need altogether. WebSurvent comes with a built in library of error messages, many translated into four or five other languages too. You have great flexibility in adding more or overriding existing ones either locally or globally. As you might hope, the package also provides good templating facilities, so that most day-to-day appearance decisions are taken outside the survey being written. To get surveys live, some fiddling about in UNIX or Linux on the web server is required, but it is achieved efficiently with a series of special commands, and these do a lot of sanity checking to ensure you dont accidentally wipe all of last nights data. This may act as a deterrent to some, but UNIX has a double cost advantage over NT boxes: not only is the operating system free, but it can handle many more simultaneous interview connections. WebSurvent surveys come in two flavours: open and closed. Closed are password protected. CfMC also supplies a utility for generating passwords and another for plugging them into the sample. It is here the program betrays its CATI origins, as all surveys need a sample file, complete with phone numbers, in order to work. Amusingly, there is even a utility to generate dummy phone numbers. The solution lacks very little. It is packed with capabilities, is very stable and offers a wide range of exports, including triple-s.
One weak area is in getting it to provide real-time statistics and reporting on live web surveys: it is hard work to get these into web screens for clients to view. Published in Research, the magazine of the Market Research Society, February 2003, Issue 441.